Today, we are sharing some amazing people who you’ve probably come across at some point in your parenting journey. Each one is sharing his/her passion with our children and influencing the paths they take in life. Whether it’s through sports, the arts, music and education – these dedicated people are doing incredible things in our community every single day. Fall is a big registration push for many of these businesses. So make sure you check out each and every one of them. We couldn’t be more proud of what these folks are doing for our little Smarties! Note: This is a long feature, but such a GOODIE! So go get yourself some coffee and get cozy with this one! 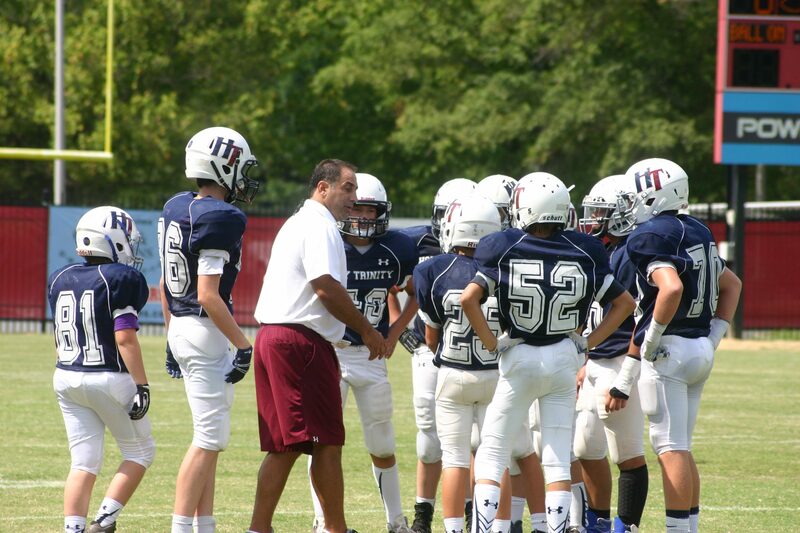 Jason Jacobs is currently the head coach for seventh grade football at Holy Trinity Catholic Middle School. Have any of y’all been to a middle school football practice or game? If so, you know this job is NOT for the faint-of-heart. It takes a special person to take control of a bunch of teen boys in the August heat and make football players out of them. Coach Jacobs is that man. We love his commitment to the sport and his team, and we think you’ll walk away from reading his interview feeling inspired (and football-smarter – he’s got great tips!). Thanks, Coach Jacobs! Go Bulldogs! What’s your background in football? I feel like I have been around football my whole life, my dad was a player and a coach for many years. I grew up going to his practices with him as a kid and hanging out with his players. It was awesome. I played for many years and have been coaching football at the youth and middle school level for 10 years. How long have you been a volunteer coach and where? I have coached various sports for about 25 years. I started as a volunteer coach my junior year in college at the YMCA. I have been lucky enough to coach many sports – football, basketball, baseball, and soccer – and at many places – the YMCA, Champs, Park Sharon, MARA, WCWAA. 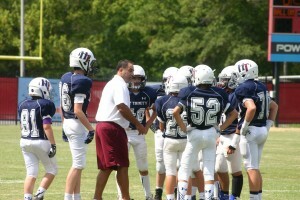 And, this is my fifth year coaching football at Holy Trinity Middle School. What age would you recommend boys getting started in tackle football? I think it depends on the young man, every kid is different and they progress at different times, but I think Pop Warner is a great organization for players between 4th and 6th grade. It’s typically a controlled environment where the young player can learn basic fundamentals and be around kids their own age and size. How can we (parents) prepare kids for middle school football? 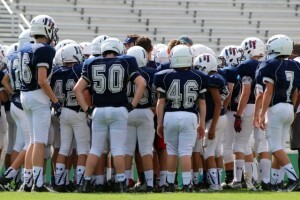 I think we (parents) put too much pressure on the physical side of preparing our kids for middle school football. I realize we want them to succeed, I get it, but at the end of the day, there are no NFL draft picks that come out of middle school. The preparation is more mental than physical. Prepare them to be coachable, a good teammate and give 110% 100% of the time. Kids can’t necessarily control their size or talent level, but they can control their effort. Prepare them to communicate with their coach if they are not satisfied with their playing time and teach them how to respectfully communicate with their coach on issues that are troubling them (i.e. role play the conversation at home with them, this will build confidence!). How do you prepare them for high school football and beyond? My mission statement has always been Life lessons through sport. This is why I love middle-school-aged players. They are still very impressionable, and I feel like you still have a chance to impact their choices in the future. We preach to our players all the time that “we are going to do, what the other guy is not willing to do” and if we do that we cannot lose, whether be in the class room, football field or in our everyday life. We are not going to be average – i.e. we are going do our homework when the other guy is playing video games, we are going to make our bed when the other guy waits for his mom or dad to do it, we are going to do 20 pushups a night when the other guy is on Instagram, and we are going to say Yes ma’am and No ma’am and hold the door for a young lady when the other guy thinks he is to cool to do that. What sport do you recommend boys play in the off season to keep them football ready? I really do not have a specific sport I recommend in the off season related to football, I have always believed in letting kids this age (middle School) be seasonal athletes, I believe a kid should try and play all sports. I am not a believer in playing one sport year round at this age. They have plenty of time to specialize. I think they need to mix it up and use different muscles, bottom line, stay active, compete and have fun. First-time football moms have a lot of anxiety – what tips do you have to calm their nerves? I was raised by a hard working single mom and I can remember when I first started playing football. I was 9 yrs old and my dad was obviously pushing to let me play. I think the only reason she agreed to let me play was because I told her I wanted to box if I was not going to play football (Rocky had just come out in theater), and I guess in her mind she thought I would be safer surrounded by ten other guys on the field vs. one on one in a boxing ring. She was right. My point in telling this story is that there are a lot of other things that kids could be doing that could cause injury or harm. Tip 1– You have to let go a little bit. Kids are resilient, they are far more tough and capable than we give them credit for, let them compete, sweat and push themselves, it reveals character. The game has changed, it’s far more safe today than it was 10 to 20 yrs ago. Tip 3– Kids will typically turn to the mom when they are tired and don’t want to go to practice, this is a defining moment, don’t take the easy way out and let them off the hook, quiz them on their ailments/symptoms. If they are truly sick, injured or not feeling well a mom knows the difference, use your best judgment, but make an effort. The point is, there are people out there every day that have commitments and they have to get up and fulfill those commitments sometimes when they are tired. Tip 4– When it comes to football and summer family vacations, the cardinal rule for football families is you never book a family vacation after August 1st, most teams have mandatory practices that start August 1. If they are a 1st time player, you are really putting your son at a disadvantage, not from the coaches prospective, but for his confidence. He now is coming back from vacation to a team that has been working hard and practicing together for a week, this sometimes is tough for a kid to overcome and they feel inadequate, give him an opportunity to succeed, do not make him feel like he is behind the eight ball. In my humble opinion the mom is the most important parent in a kids athletic success rate, not the dad. In my experience if the mom is committed to every aspect of the sport and holds there athlete accountable, they a have better success rate. Furthermore, I believe it has even been medically documented that the athletic gene comes from the Mom, not the dad. I certainly believe that to be true, not only physically, but mentally. Sorry dads, if your kid is a player it’s probably because of the mom, not you! What do you expect from the boys on your team? I expect them to be gentlemen and leaders, I tell them all the time that they are special because they play football, but with that comes responsibility, meaning you are expected to sit in the front row of your classes, do your homework, make good grades, have good manners, be on time, wear a tie on game day, respect your parents and teachers, help out around the house, be kind to others, be a hero to someone, not a bully, bullies are cowards that lack self confidence. My job is to help develop young men, not just football players, we are just using the sport to channel this behavior. We expect them to be champions in every walk of life and these are just examples that we think do that. It’s all relative, this should translate to how they compete on the field. 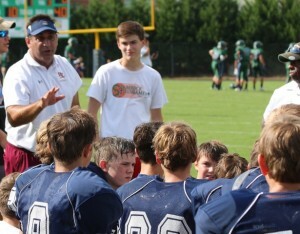 What lessons do you try to instill in your players that take them beyond the football field? Take pride in what you are doing, if you are going to do something, have a purpose behind it, don’t just do it to do it. Invest in your time, don’t waste it – i.e. study successful people and athletes, read a book, work out, give back to the community, spend your time wisely, not just playing video games or looking at Instagram/Facebook. I tell my guys all the time, body language speaks volumes, carry yourself with pride, stand up straight and when speaking to someone always look them in the eye. Jeff Jarosz has been in the Charlotte high school football scene for a LONG time and has awesome advice and insight for parents of current or future high school football players. He’s currently head coach at Ft. Mill High School, and also runs a strength and conditioning and football skill development program in Charlotte called Game Time 4 Athletes with his son, Jordan. Read more to learn about this program (psst! It’s not just for football players!). We love what he’s doing for young men in our area. Thanks so much, Coach Jarosz! Go Yellow Jackets!! I started playing football in sixth grade and continued playing through high school and college. After graduating from college, I became a freshman coach at my former high school, St. Edward in Lakewood, Ohio. For over 50 years, I have been involved with the game of football. How long have you been a coach and where? I have been coaching for 38 years. I’ve coached at St. Edward High School (Lakewood, Ohio), West Mecklenburg High School (Charlotte, NC), Providence Day (Charlotte, NC), Independence High School (Charlotte, NC). and currently at Ft. Mill High School (Ft. Mill, SC). In 1995, Matt Keane and I started the Holy Trinity Football program and was involved for over ten years coaching there in addition to my high school coaching duties. Tell us about Game Time 4 Athletes. My older son (Jordan-NSCA certified) and I run a strength, speed and agility program called Game Time 4 Athletes. 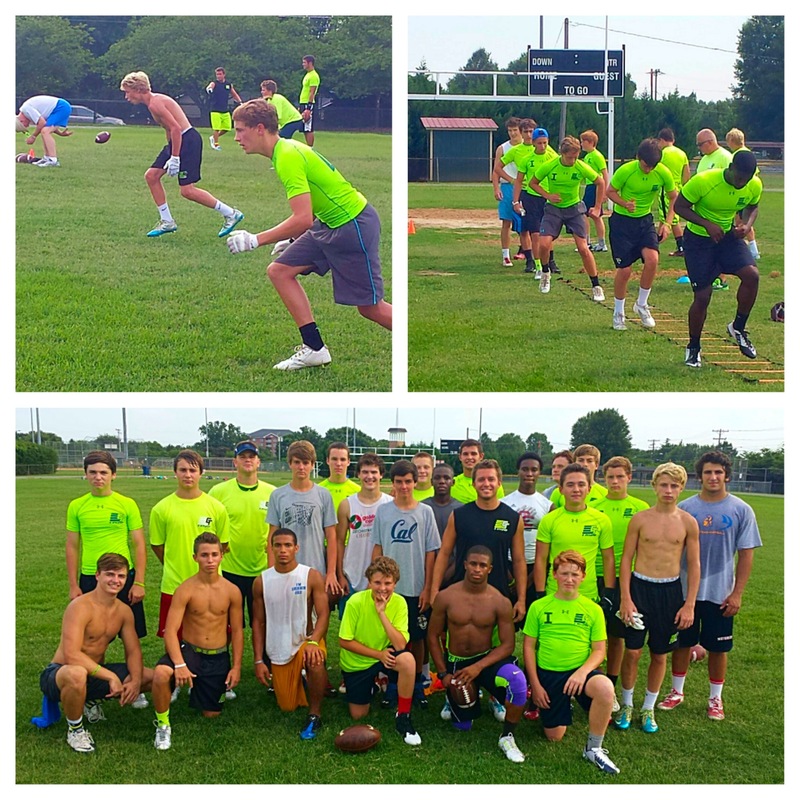 In addition, through Game Time 4 Athletes, we offer a Football Skills Academy in the off-season for (QB-WR/TE-LB-DBs). Our Strength, Speed and Agility training sessions are 1.5 hours, and are held in small groups of 2-10 athletes per session. We focus on all three phases of the athlete’s requirements for strength, speed, and agility. We offer in-season training as well as off-season training as training needs differ for the athletes. 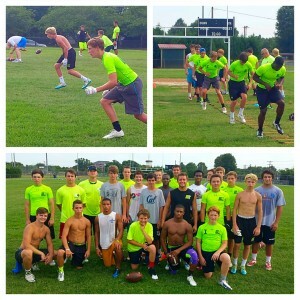 Our athletes are comprised of football, lacrosse, and rugby players. In addition, our program now includes adults who have sought out our help in private one-on-one hour long training sessions. We don’t advertise, as our business has grown through referrals from our clients. What are the best ways for a player to prepare for high school football? It starts in the off-season in the weight room as the foundation for success. We recommend at minimum two sessions per week, though three sessions per week are ideal. We believe that with any sport, “strength punishes and speed kills” and we train accordingly. Strength, power and explosiveness are derived from strength training and helps our athletes become faster and quicker. When specific speed and agility training is added, an athlete benefits from all three phases. During the season, it is important to retain strength and through a modified training program, athletes can remain strong. The benefit of training properly also helps reduce injuries. How do you prepare them for college football and beyond? Very few athletes get the opportunity to play collegiate sports. We have been fortunate that several of our athletes have had the opportunity to play college athletics. Currently, we have seven D1 football players, and over fifteen more playing D2 and D3 football. Three of our clients are playing D1 lacrosse. The training isn’t any different other than the level of intensity is increased through volume (weight/sets/reps). Once in college, they train with the strength and conditioning staff at their respective colleges. Many of our college athletes return in the summer to attend our Football Skills Academy to keep their skills and techniques sharp. What are some good cross training activities for football players? Playing another sport is always beneficial. It allows an athlete to decompress from their main sport, and forces them to use their muscles in a different format that helps in overall athletic development. Commitment. All team sports require 100% commitment from its players if they want to be successful. It may sound easy, but commitment is an all-season mindset. You have to be committed in the off-season, pre-season and in-season. Effort. That’s the one factor that’s hard to coach. It’s up to the individual athlete to put forth the effort required. Skills and techniques can be coached, and combined with a player’s great effort, the results are an improved player. Respect. Respect for the game, their teammates, their coaches, and their opponent. First off, it’s imperative to enjoy the experience. If you enjoy what you’re doing, you develop a passion and love for that particular experience. Once you have that passion, you develop all the key characteristics to achieve success. Traits like commitment, respect, discipline, effort, teamwork, character will help them in their professional and personal lives as adults. How do you see the sport changing in the next 5-10 years? Football continues to evolve from a technology standpoint with improved equipment and training tools. I anticipate there will continue to be modifications to the rules that will make the game safer. In high school, they are limiting the amount of contact you are allowed to have in practice during the week. Furthermore, I believe nutrition and supplementation will have a bigger impact in all sports. First and foremost, it is the relationships you develop with your players and your fellow coaches. Secondly, I enjoy the teaching aspect of the game of football. It’s the ultimate team game with many parts to it: offense/defense/special teams, starters and backups all have a role. Your success is based on getting everyone to be “All In.” I would rather have someone call me “Coach” than by my given name. It means you have earned the respect of that player, parent or competitor. Being called “Coach” is a respected term of endearment, and one that is with you the rest of your life. How can we register for your training camps? You can email me at jeffjarosz@yahoo.com or call 704-619-8517. And follow us on Instagram @GT4A. Josh Wood is the Community Outreach Director for the Charlotte Eagles Soccer Club. 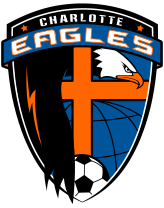 The Charlotte Eagles Soccer Club seeks to generates teams of influential players and coaches who can flourish in and for Christ wherever they are planted. Since 1991, the Charlotte Eagles Soccer Club has been actively mentoring youth and encouraging families through the common bond of soccer. Whether a new recreation level player – or an advanced, experienced premier level player – Charlotte Eagles Soccer Coaches are such an asset to our soccer community. Tell us what’s happening with the Charlotte Eagles/Y Soccer Program. 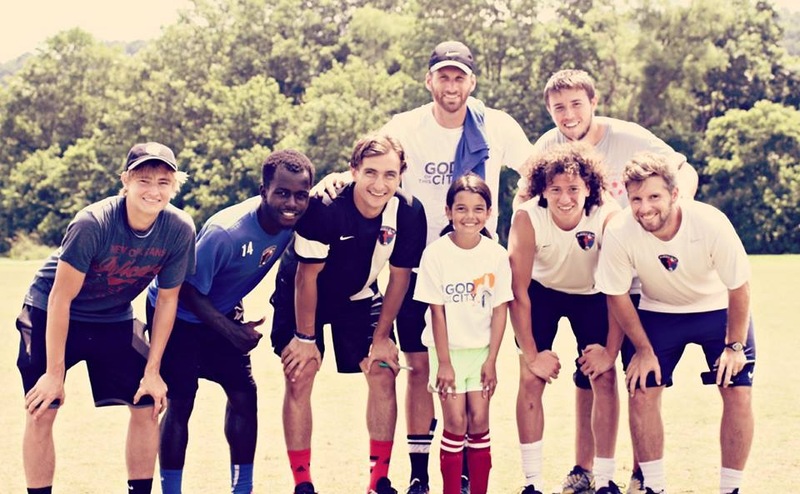 The Charlotte Eagles began a partnership with the YMCA in 2014, aimed at discipling the coaches and players involved in the soccer programs across various branches. We assist the YMCA recreational soccer league by helping to write innovative curriculum and providing on the field assistance each practice. This daily presence of our coaches allows for us to teach effective coaching principles as the practices happen and disciple the players through our empowerment of volunteer coaches. Our vision for the YMCA and any organization we partner with, whether it is a church overseas, or a local college team is to empower coaches by equipping them with the tools they need to change lives for Christ. We are excited to be coaching an all-star program at the Siskey, Harris, and University City YMCA’s this coming Fall that allow some of the best players from every team to attend special coaching sessions with one of our Eagle’s coaches. These sessions occur once a week and are each 60 minutes long. This is a YMCA program, so only YMCA recreational participants can attend! This gives every player the opportunity to improve and challenge themselves within the YMCA program! Tell us your coaching philosophy for the players. Our goal is for every coach involved at the YMCA to view their season as an opportunity to impact and influence their players. We aim to harness the tremendous platform each coach has and leverage it for good, creating better players and better people. Most coaches don’t realize that they possess a tremendous platform. Through an 8-week season it is possible to build deep relationships with your players. Through these relationships, we hope to see life’s transform. This doesn’t happen by chance, it happens when a coach recognizes the opportunity and is equipped to speak truth and life. This might happen on the field during a water break or in the middle of a drill as one team is losing. It is our job to give coaches the eyes to see these opportunities and the tools they need to step in and positively impact their player. I love seeing coaches, who lack confidence, begin to view themselves as leaders capable of changing lives. Seeing families change, through reinvigorated leadership gets me up every day! How can we register our kids? 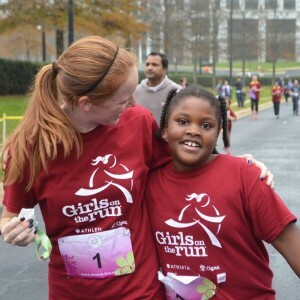 If you have a girl in your household, you’ve probably heard of Girls on the Run (GOTR). This is hands down one of my favorite girl-power after school activities! 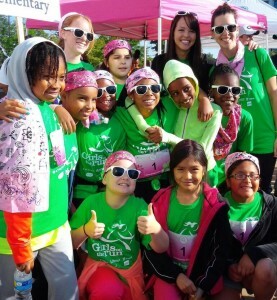 Founded in 1996 by local Charlotte running guru, Molly Barker, GOTR started with 12 brave girls and has grown into a national and international program with over 179,000 girls participating worldwide. 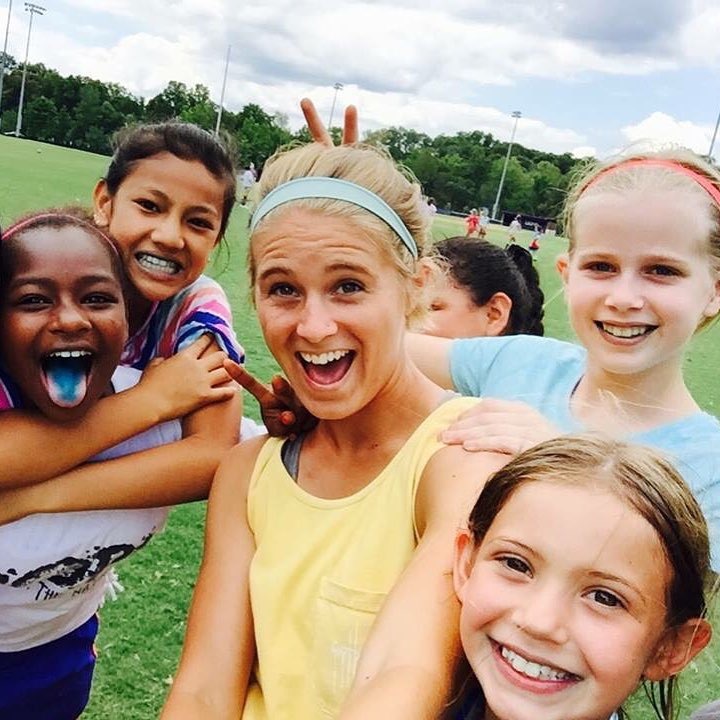 Smarties, let’s get to know the amazing people behind GOTR! Here’s GOTR’s Ann DellaValle, Fundraising and Marketing Manager. Girls face social pressures and conflicting messages about how they should act and who they should be. Studies show that by adolescence, girls’ confidence drops about twice as much as boys’. Friendships become more complicated and challenging, girls’ perception of their academic ability declines, the likelihood of anxiety and depression increases and participation in physical activity plummets. It doesn’t have to be this way. Tell us the history of GOTR and how it all started. Girls on the Run of Charlotte was established in 1996 by Molly Barker with the help of thirteen brave girls. Twenty-six girls came the next season, then seventy-five. In 2000, Girls on the Run International, a 501(c)3 organization, was born. 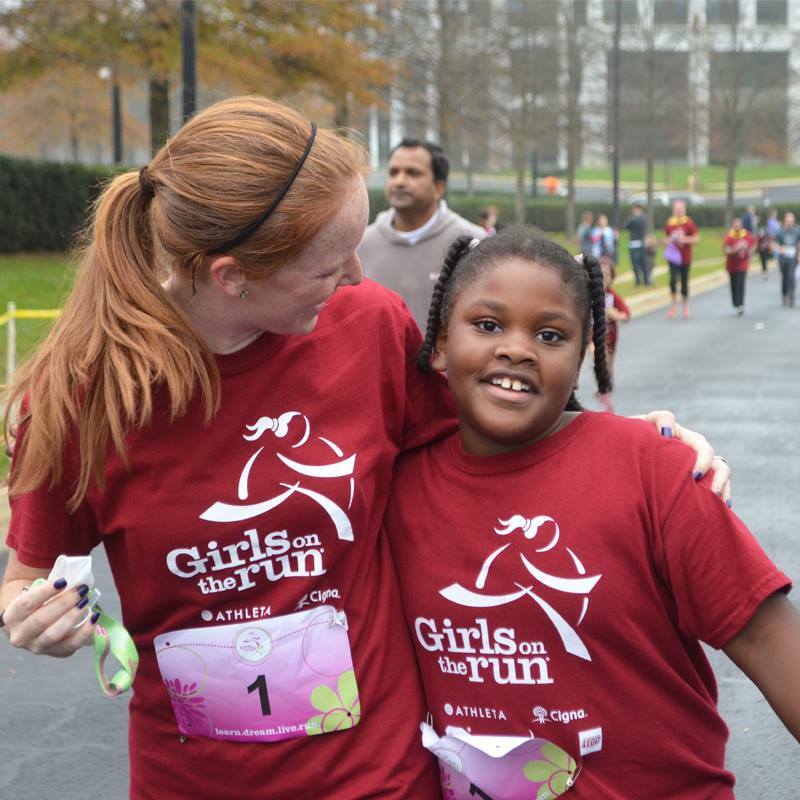 Today, Girls on the Run Charlotte has 130 program sites in Mecklenburg, Cabarrus, and Lincoln counties. In 2015, we served over 3,750 girls and, with the help of our generous sponsors and donors, we were able to provide financial assistance to 50% of our girls who otherwise would not have been able to participate. Girls on the Run Charlotte is a subsidiary council of Girls on the Run International, which has a network of over 200 councils across 50 states and the District of Columbia. With the help of almost 100,000 volunteers, Girls on the Run served nearly 180,000 girls in 2015, including our millionth girl! Girls on the Run continues to grow and currently hosts more than 350 end-of-season 5K events across the United States, making the Girls on the Run 5K series the largest in the country. 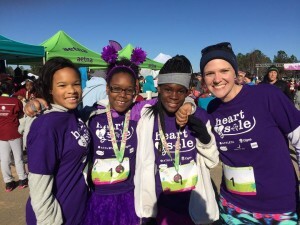 Girls on the Run has also expanded to include middle school girls through Heart & Sole, a program dedicated to the unique needs of adolescent girls. Tell us your coaching philosophy for girls. How do you motivate your runners? What does a typical training schedule look like for a school team? The girls meet two times a week for 10-weeks during the season with their teams and coaches to implement the curriculum with lessons and games that incorporate running. The girls set their own personal lap goal based on how many laps they’ve completed previously, how they are feeling that day, and the amount of time that they have to run. Midway through the season, each team does a practice 5k at their site. At the culmination of the season we host our two regional Girls on the Run Series 5ks, which the girls, their coaches, and their running buddies participate in. The 5k day is such a wonderful day, and gives the girls a tangible sense of accomplishing a goal they’ve set just 10 weeks earlier. If they can cross that finish line, however they get there –running, walking, skipping, or jumping – they’ve accomplished their goal. What is your vision with GOTR in 5 years? Our vision for Girls on the Run of Charlotte in 5 years is to increase the number of girls and program sites in Cabarrus and Lincoln counties, as well as increase the number of sites and girls participating in our new middle school program, Heart & Sole… We currently serve these Cabarrus and Lincoln County but are just hitting the tip of the iceberg as far as how many girls we could be empowering in those counties. How can we register our girls? Online Registration – Parents/Guardians are able to sign their girl up online any time between Friday, August 26th and Tuesday, September 6th. Girls on the Run of Charlotte engages in a lottery based online registration system to ensure a fair and equal process for all girls. Girl Placement Day will occur on Wednesday, September 7th, this is when the online system will randomly select girls that signed up for a designated location. Paper Registration – Please contact the school for the registration form and additional information as paper registration is managed by the Site Liaison at the school. All completed registration forms and payments are due to our office by Friday, September 9th. Paper registration is first-come, first-serve. Meet Terry Fritch. 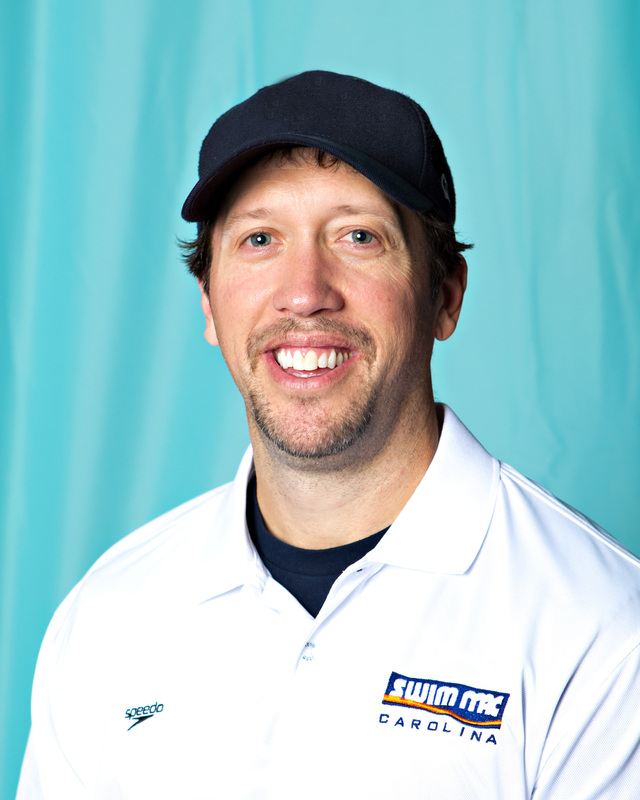 He’s the Director of Competitive Programming at SwimMAC Carolina where helps lead the organization in all aspects of its programming. 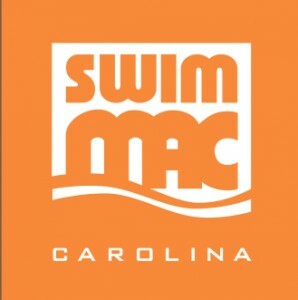 If you’ve been in Charlotte for more than just a few years or are lucky enough to be born and raised here, you know that one of the first things that pops into your head when you say “competitive swimming” is SwimMAC. It’s been around since 1977, which makes it an “original” to many of us Charlotteans. SwimMAC is a non-profit organization that provides programs such as parent-tot, “learn to swim,” advance swim lessons, year around competitive team, and adult programming such as Masters, adult lessons, and adult fitness. Their goal is to provide quality aquatic programming to the greater Charlotte area, which includes the Charlotte, Huntersville, Lake Norman, and Waxhaw areas. Their “home pool” is at Charlotte Latin, but they have several locations around town. We’re coming off a HUGELY successful Olympic swim year, and a lot of that has to do with SwimMAC – we are so proud that they’re our very own! We’re very excited to get to know Terry and SwimMAC a little bit more right here! I moved to Charlotte to join SwimMAC in 2000. I was formerly a YMCA aquatic director and head coach. When interviewing for SwimMAC, I connected with the family atmosphere and the organizational drive to care about the “whole” kid and not just teach them how to swim well. I also really enjoyed the area and what it had to offer. As mentioned, I join SwimMAC in 2000 and worked here until 2006. I then moved to Sugar land, Texas (outside of Houston) to join First Colony Swim Team. I was pretty successful there, but as a family we missed Charlotte and wanted to return. I had an opportunity to rejoin SwimMAC and have been here ever since my return. My position at SwimMAC is Director of Competitive Programming and I am helping to lead our organization in all aspects of our programming. Along with that role, I do coach a practice group at SwimMAC. Tell us your swimming philosophy at SwimMAC. To provide quality programming at every level (swim lessons to competitive team) to the community that will be inspiring, comprehensive, and fun. We want to show all the great qualities and habits swimming can create to be successful in life. 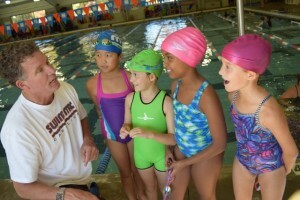 Tell us about the SwimMAC instructors. We believe our swim instructors have the tools and knowledge to teach in a nurturing style. What age would you recommend getting started in swim? As early as infants. Our parent-tot class is a great way to get acclimated in the water. At an early age the emphasis should be on being safe around water and having fun. Stroke proficiency will come as they get older. They need to enjoy the water first. How does the Summer Olympics affect your swimmers? The Olympics provides an opportunity to celebrate what our sport can be. Not just the competition but getting to hear all the great stories about how our Olympians made it to that big stage. It is very inspiring and motivating. We get to see that these athletes aren’t superhuman, they went through hard times and have moments of failure but was able to overcome them. We all have doubts and obstacles and to be able to hear the stories can be very motivational and relatable. Our athletes have an opportunity to feel proud about the sport they have chosen to be in. What are you looking for in a year-round competitive swimmer? We look for a swimmer that is excited about swimming, proficient in all 4 strokes, and shows characteristics of being a good teammate. What is your vision with swim in the Charlotte area in 5 years? Our vision in the next 5 years is to continue to build on the foundation of core beliefs that built this club and use that to promote SwimMAC and swimming to more areas of the region. As well as to continue to be a model program in USA swimming to keep the sport attractive and inspiring to all level of kids. 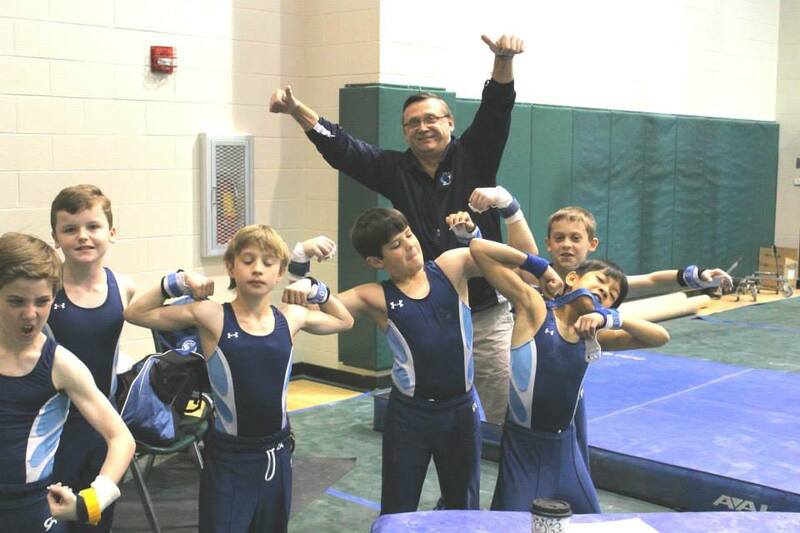 Since 1993, Coach Stass has been a legend in the NC Men’s Gymnastics circuit. If you have a son serious about gymnastics, you will eventually make your way to Zenith Gymnastics where Stass is coach and owner. When you first meet Stass, you may be intimidated by his Russian roots and history of producing champions. But you’ll be quick to realize that Coach Stass is one of the most kind-hearted and passionate men and coach you’ll ever meet. We’ll let Stass tell you his story! Zenith Gymnastics opened its doors in July of 2009. It has been growing ever since. 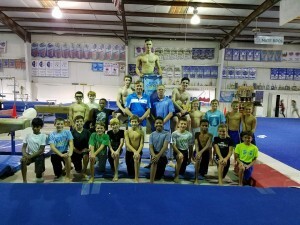 It is one of the premiere gyms for boys’ gymnastics in North Carolina. 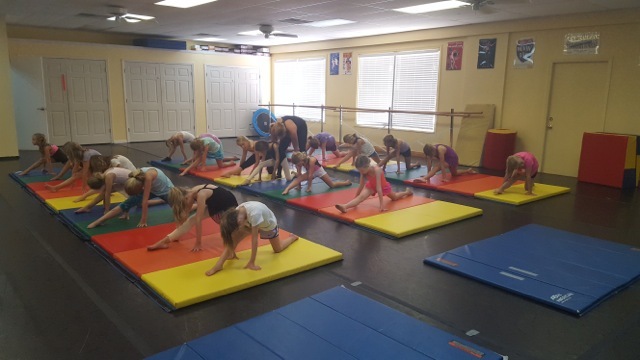 Zenith offers classes for all gymnasts ages 3 all the way up to adults. We strive to provide a safe and fun environment where gymnasts can grow and excel, while having fun. We have a competitive team for both girls and boys, and a recreational program for kids of all ages. Stanislav Savitch, Coach Stass to his boys, was born in 1959 and started gymnastics when he was 7 years old. He fell in love with the sport and continued to improve his skills until he made it to the Junior National Team for the USSR. He continued his career in gymnastics through college and achieved the designation of Master of Sport in gymnastics. He graduated from the Lezgaft National State University of Physical Education, Sport, and Health in Saint Petersburg, with a degree in physical education with a focus in gymnastics coaching. He coached at the Zenith Sports Club, Dynamo Sports Club, and the International School of Physical Education Olympic Reserve as a Head Coach for gymnastics. In 1993 he was invited by Gymcarolina Gymnastics in Raleigh, NC to come to the USA and start their boys team program and his dream to own his own gymnastics academy was born. He did so and coaches a Gymcarolina until 1999, when he was offered a position at Wyendt’s Gymnastics in Charlotte, NC. He started the boys program at Weyandt’s in 1999 and grew it into a nationally competitive program. 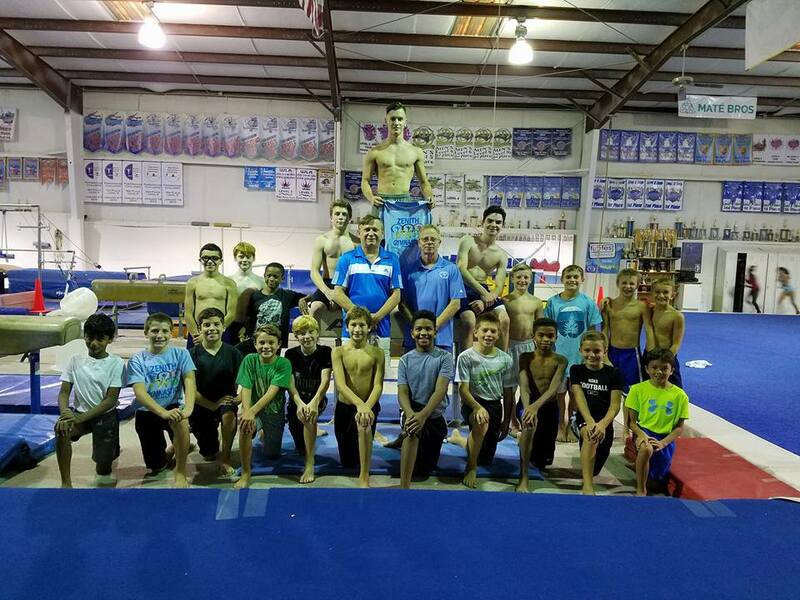 In 2009, he was finally able to realize his dream of owning a gymnastics academy, and in July, Zenith Gymnastics opened its door for the first time. Tell us the history of Zenith Gymnastics and what motivated you to start it? Zenith Gymnastics was a dream the Stanislav Savitch has in his head from the moment that he came to the USA. He has worked for years to make it a reality and was able to do so in 2009, when the gym that he was working at was forced to close its doors because of the recession. He had to make a choice to look for another position at an existing gym, or to take a chance and open his own gym. He could not let the opportunity pass him by. The name Zenith came from the first gym that he practiced in as a child, and the first place that he worked as a coach, the Zenith Sport Club. He wanted to honor the place that gave him his start in the sport that he loves. How does the summer Olympics affect your gymnasts? The Olympics are a great motivator, both for new gymnasts and for those that are already involved in the sport. The Summer Olympic Games inspire gymnasts to excel and to work even harder towards their goals, big and small. It also draws new interest in the sport. Tell us your coaching philosophy for team. For me coaching is all about helping athletes achieve their goals, and become the best gymnast they can. This requires trust, respect, and hard work on the part of both coach and gymnast. Gymnasts must trust that the coach will be there to spot them if they get in trouble, will not have they work on skills that they are not ready to do, and that the coach knows when they ARE ready, and be willing to try a skill even if they are scared. Coaches must trust that the gymnast will listen to their corrections and will try their best during practice and competition. There must be mutual respect. Coaches should respect each gymnast as an individual, and gymnasts must respect their coach as an expert that has their best interest at heart. When there is respect between a coach and his gymnast, it limits conflict, and makes a strong relationship. As with all sports, hard work is one of the most important aspect of gymnastics. I cannot force a gymnast to work hard during practice. It must be a choice that they make themselves. As a coach, I put my all into every gymnast and help them become the best that they can be. I believe that there is always room for improvement and no skill is even truly mastered. I focus on making sure that all of my gymnasts have a good understanding of basic body positions, base skills, and form. Body positions, so that they understand how their body is supposed to feel when they are doing a skill right, base skills so that they are able to build on those skills with harder and harder skills easier, and form so that they get the best possible score that they can (pointed toes and straight legs can be the difference between a 1st place medal and no medal). What is your favorite part of your job as coach? Working with the children is my favorite part of coaching. I love children and I have made it my life’s work to help them grow and become better adults though skills like time management, correct social interaction with their peers, and the ability to keep trying even if something is hard. Coaching gymnastics combines my passion for the sport and my love of children to make it a dream job. Using my experience and knowledge to help my boys achieve levels of performance that they would not be able to achieve on their own is one of the best parts of coaching. How do you motivate your gymnasts? I come to the gym and give my best each day, and I expect all of my boys to do the same. For me it is the process of practicing, competing, and improving that is important, not winning. The words “I can’t” are not allowed inside the gym, instead there is “I will try.” I let the boys know that I do not expect perfection, but that I do expect them all to put in 110% each practice. What does a typical training schedule look like for team? The boys start practicing 6 to 9 hours a week when the start out on team. As the progress and improve over the years the number of hour increases to 12, 15, and 18. During a practice they work on 3 events each day so they rotate which muscles they use and what skills they work on. At the start and the end of each practice there is a block of time spent on conditioning and flexibility. What skills and mental drive do you look for in gymnasts who compete at the highest levels? At the highest levels there is a drive that is required in order to succeed. A drive that pushed the gymnast to work hard during every practice and that makes them get up and try again when they fail. Being able to balance practice, school work, family, and other responsibilities is also very important. Having good form while they perform all skills, not just easy skills. At the highest level, gymnasts all learn the same skills, so the best show themselves in how well they perform those skills, and how well they handle the pressure of competition. What is your vision with Zenith in 5 years? In 5 years I see Zenith continuing its mission to become one of the best places for gymnastics in Charlotte. We will continue to grow our competitive girls program so that it becomes just as good as our competitive boys’ program. I hope to expand and hire more coaches so that our gymnasts get the best coaching regardless of what level they are at. To register you just have to call us at 704-568-1277 or e-mail us at zenith_gymnastics@live.com. Our office staff will help you with the process and find the class that is the best fit for your child. We also offer a free trial class to all new students, so your child can try a class before you sign up! Jami Masters is an icon in the Charlotte dance community. Jami has poured her heart and soul into every dancer who has walked through her doors for over 28 years. Her philosophy to instill the love of dance is threaded through everything she does at Jami Masters School of Dance. Jami’s dancers come in all shapes and sizes and all levels. But you can rest assured at the end of each dance season, her dancers will shine bright on stage and will grow into strong, confident, successful and beautiful young women and men, thanks to her instruction and passion. Located in the Back Lot of Park Road Shopping Center, Jami Masters School of Dance (JMSD) focuses on dance technique training for performance. Classes are available for ages 2 through adult. You’ll find classes in Creative Movement and Tumbletots, for the youngest dancers; and Ballet, Pointe, Jazz, Tap, Modern, Contemporary, Acrobatics, Hip Hop, Cheerdance, Pilates, and Musical Theater for a variety of ages. Tell us the history of JMSD and what motivated you to start it? JMSD was founded by Jami Masters in 1989. After earning a BS in Education and Dance from Missouri State University I opened the dance school and started with a few students and one dance room. Now, 28 years later, the school has grown to five dance rooms and annual enrollment of 900 students. We continued to strive in providing a nurturing learning environment for our dancers throughout the years. Tell us your dance philosophy at JMSD. 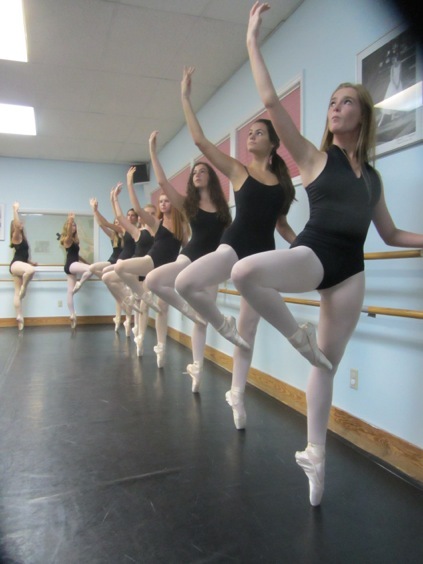 The JMSD philosophy is to provide our dancers with a balanced dance technique curriculum so they are prepared to do whatever they choose in life. It is extremely rewarding for me to see our students progress and watch them grow throughout their childhood. Many of our dancers return to visit as alumni and share great memories of their dance experiences at the studio. Tell us about the JMSD instructors. Our JMSD dance teachers were educated in highly accredited dance programs and many have professional performance experience. They are all very dedicated to teaching our students. What age would you recommend getting started in dance? One can start dancing at any age! 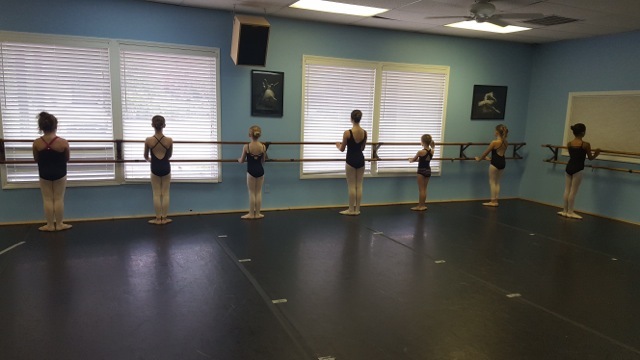 We have classes available starting at 2yrs old and many of our dancers begin at age three and continue through high school. 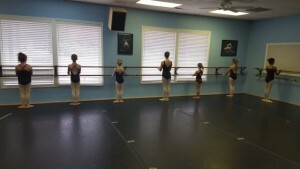 What classes are a must for young dancers to prepare for Company auditions? Our Company program consists of all dance genres, so we encourage our dancers to prepare by taking classes in Ballet, Jazz, Modern, Tap. What are you looking for in a Junior Company and Company dancer? We want our Jr Company/Company dancers to be dedicated to their classes and learning, and always represent JMSD with respect. What is your vision with JMSD in 5 years? In 5 years, our vision is to continue teaching quality dance in a nurturing and professional environment. 530 Brandywine Rd. Charlotte, NC 28209. We think one of the BEST ways to fall in love with cooking again is to attend a Chef Alyssa cooking class, and one of the best ways to get your li’l Smarty to embrace new foods and learn amazing cooking techniques is to enroll him or her in a Chef Alyssa summer or day camp. She is truly changing the way parents AND kids think of cooking and food. We are so lucky to have this culinary guru right in our backyard. 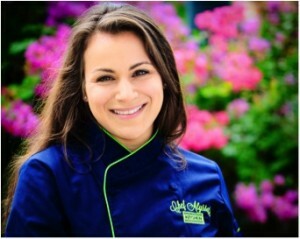 Growing up in Charlotte, NC, Chef Alyssa has been involved with cooking nearly her entire life. A 2005 graduate of the Art Institute of Charlotte, Alyssa started and ran her own catering company while in school. Her professional career has taken her to Italy and several restaurants in Charlotte that range from upscale, country club to small intimate dining. In 2013, Chef Alyssa opened Chef Alyssa’s Kitchen inside of Atherton Market in South End. Focusing on using healthy, local and sustainable ingredients Chef Alyssa teaches hands-on cooking classes covering a variety of cuisines and ability levels. During the summer she hosts interactive kids culinary camps. In 2015 and 2016, Chef Alyssa’s Kitchen was named Best Cooking Class by Charlotte Magazine. Previously she had been crowned the 2014 Iron Fork Champion, cooked twice at the prestigious James Beard House and her recipes had been featured in Food & Wine Magazine. 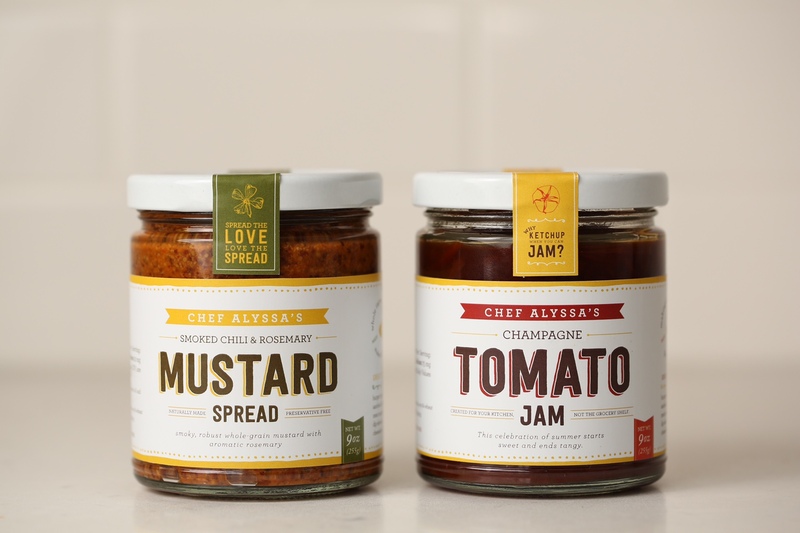 In 2016 Chef Alyssa competed on Food Network’s Beat Bobby Flay, and launched her own line of condiments. Currently, she can be seen cooking every Saturday on NBC Charlotte. Tell us the history of Chef Alyssa’s Kitchen and what motivated you to start it? Three years ago Andrew and I started Chef Alyssa’s Kitchen to bring both our passions together: food and hosting fun events. 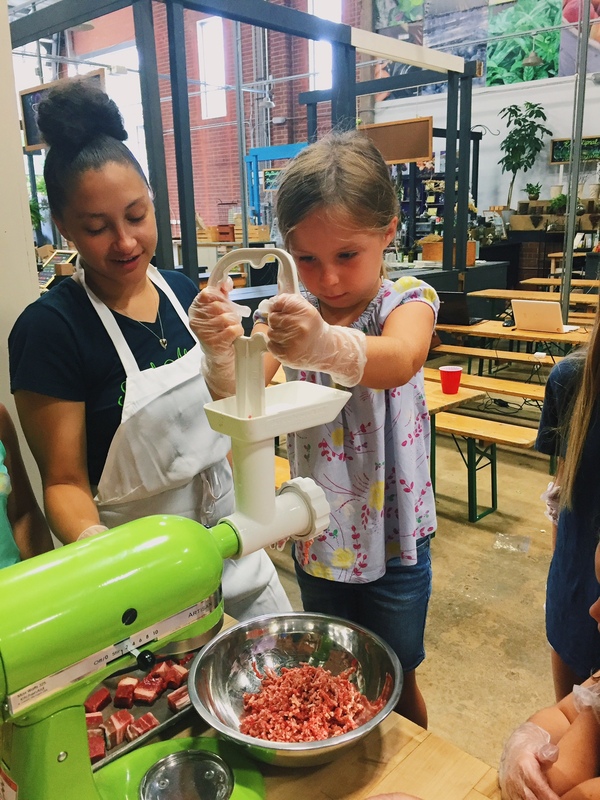 Once we identified the need for cooking classes in Charlotte, we started as a pop-up style event, offering an evening cooking class one to two times a week. We slowly began adding team building classes and grew the public class offerings. Andrew and I left our full-time jobs in 2014 and were able to focus fully on the business. We now hold about 145 classes a year. Tell us about your kitchen philosophy. Cook clean and eat clean. I focus on using quality, local and wholesome ingredients to build a better dish. What is your favorite part of your job as culinary “coach”? I truly love helping people become more efficient and inspired in the kitchen. It’s amazing when people tell me they’ve made a dish of mine at home or that I’ve helped them to unlock some mysteries in the kitchen. Recently a guest told me that she watches my TV cooking segment each week because she knows she can recreate the dish easily at home for a great meal. How do you motivate kids to try new foods and new cooking techniques? Kids are so eager in the kitchen. I think that if they have a part in the process and can take ownership of something, they are willing to eat it. If they cut up the broccoli to add to the stir fry, they will most likely try it. 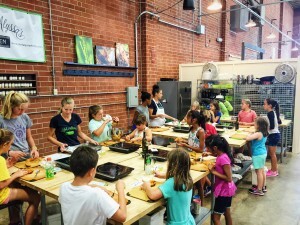 What does a typical class or camp look like for a chef-in-training? Each day of camp is built around a dish. For example: Taco Day. Kids make the tortillas from scratch; season, braise and pull the chicken; make guacamole and pico de gallo; and then crumble the cheese and make garnishes for the dish. We want them to look at a plate of food, break it down and understand the work it takes to make each element. We do the same with other favorites like pizza and burgers. How do you think your classes and camps can change a child’s life for the better? Being excited about food is such a wonderful gift. It’s something essential to our lives, and if you’re cooking you’re most likely eating better too. I think having these skills in the kitchen will make kids into healthier and more independent adults. What is your vision with Chef Alyssa’s Kitchen in 5 years? We are growing the business in more ways than just our hands-on classes. 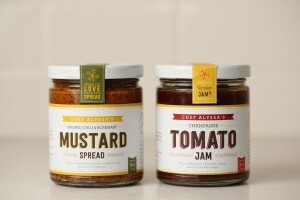 In January we launched Chef Alyssa’s Spreads, which is the beginning of our product line. We have two very versatile condiments one is a Smoked Chili and Rosemary Mustard and the other is a Champagne Tomato Jam. Both are unique in the market and make everything from sandwiches to marinades better. The other project in the works is an online video series. This will be a series of monthly videos and recipes sent directly to your inbox. This will be released in November. We want to see growth on all these areas over the next 5 years. Brand new to Chef Alyssa’s Kitchen are the Day Cooking Camps. Structured similarly to the summer camps, our first one will be held on Saturday October 15th. Space is limited but please visit www.chefalyssaskitchen.com and email us: info@chefalyssaskitchen.com for more information. Music Together of Charlotte is music and movement classes for children, age birth to five, and k-2 graders, with the adults who love them. 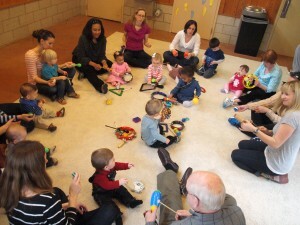 It is a fun, non-performance-oriented, playful atmosphere where innate love and joy of experiencing and creating music is supported and facilitated. Here are Phyllis & Carrie! Tell us the history of MToC and how it all started. Hard to believe we are at the beginning of our 16th year! Carrie, one of the co-owners, took MT classes with her children in Manhattan, and when she moved here to there was no MT. So she took the training and began classes in the fall of 2000. Phyllis, the other co-owner started a year later, and one quick year after that, the two became partners. Both Carrie and Phyllis began their individual MT journeys as a way to bring music into the lives of their families, and are bonded by the mission of bringing music into the lives of all families. Tell us your philosophy at MToC. The purpose of a Music Together class is to create a playful environment for families to interact musically with their child. The secret ingredient in our recipe is the teachers ability to guide the adult participant in being the child’s main music teacher. Our program is based on research that suggests that all children are born musical and that a rich environment of music will support a child’s rhythmic and tonal development. The main message to our families is to take what we do in class and use it at home with their little one. 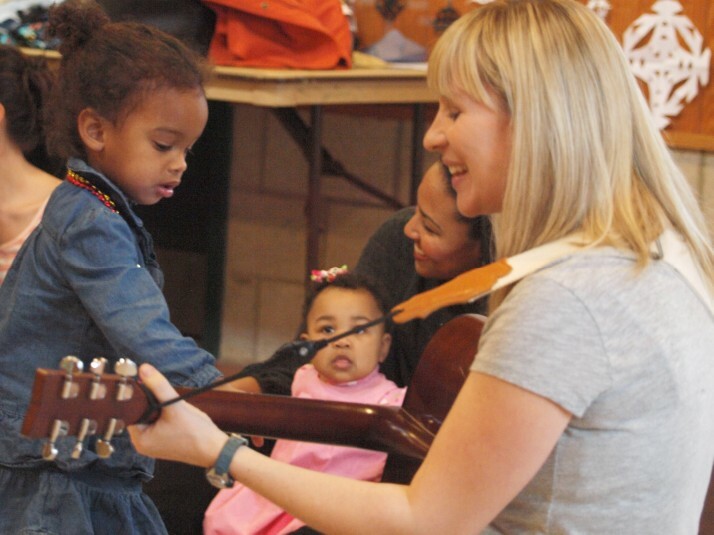 Our classes can benefit both their parenting and their child’s musical development. Forming new relationships with families over time and seeing the joy that being in class brings to them and their children. I also love seeing families that don’t think they are musical absorb the songs, silly dances, chants, and report back after 2 or 3 sessions to share how much the classes have impacted their experiences as a parent or a caregiver. They tell stories about hearing their child sing for the first time or that using the “bee song” helped them get through a squirmy diaper change. Music is a powerful parenting tool. A typical class is 45 minutes of unplugged musical interaction between a child and his/her caregiver. The classes are meant for a whole family- so you can have a newborn and a three year old in the same class. The teacher guides the adults in both small and large musical movement activities. The adults in the class are asked to sing. Yup, we tell all families what happens in these four walls stay in these four walls. As the adults let loose you can imagine the kids do too. And that’s when the magic begins. What ages can a child enroll in MToC? What is your vision with MToC in 5 years? Keep doing what we’re doing- but for more families. We’d like to broaden our outreach efforts to include families and kids who might not be able to attend classes due to location, schedules, or income. 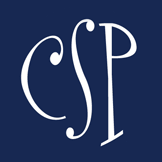 www.musictogetherofcharlotte.com. Our website is easy to navigate and has all the info you need to register. OUr administrator, Sharon, is also super responsive and can help answer any questions.